That’s what Esteve more or less intended to do the moment the ferry ramp was down – twist the throttle and not let it go until he got to Barcelona. That was a very long way, quite a lot more in fact than the journey to Almeria at the beginning of the trip, which had been a bit over 800km and had taken us quite a lot longer than we had anticipated. We were talking about close to 1,200km here, a distance that we had planned to split in two riding days – the first one from Algeciras to Ademuz, where my family has a house, saving us the cost of accommodation. Esteve, however, was tired of so many days on the bike and insisted that he wanted to get home as soon as possible, and if that meant doing it on one go, so be it, he would have the whole weekend to unpack, rest, relax, and get ready to go back to work on Monday, a return that he feared would be stressful. I had tried to dissuade him, but there were other factors in play – remember the issue with Gerard’s bike’s forks? He and Raluca were not particularly looking forward to the long ride back either, even if it was in two days, so they were toying with the idea of calling the insurance regarding the botched repair, have the bike sent home, and get a lift back to Barcelona at the insurance company’s expense, maybe even spending a day visiting Granada. I must confess at this point that I was in part to blame for both Gerard’s and Esteve’s plans, as I had discovered some days before that I had forgotten the keys to the house, meaning that if we split the return in two we would have to pay for a hotel anyway. The night before Esteve had already made up his mind that he was going to ride back in one day, and I was thinking about doing the same. Gerard and Raluca said that they would decide once they got off the ferry, so we agreed that the best thing to do was to say our goodbyes on the ferry and start the journey immediately out of the harbour. We had got the boarding passes the day before, so this time we did not need to get up ridiculously early – departure was at 9am and we got to the harbour half an hour before. The 6th of January is an important holiday in Spain, when most people exchange their Christmas gifts, so everybody would be spending the day at home with their families and we were not expecting a long queue to board nor problems with traffic across Spain. When we rode past the booths where they checked our boarding passes I was expecting to go straight to the queue to board, but instead found that we had to go through a customs checkpoint. I thought that we were done with that after crossing the border into Ceuta, we were already in Spanish and EU territory after all, but it seems the authorities were not happy with that. The dog finished with the van, the driver got back in, started and rolled away. The police officer with the dog looked at our three bikes, the dog was looking away in the opposite direction, the officer looked at the rest of cars in the line, looked back at us and waved us past with a quick movement. The dog did not even turn to look at me. With a sigh of relief, we rode on, only to find that there was yet another checkpoint to cross before the ferry, this time with an employee of the ship company and another customs police officer, checking passports. I had already put mine away, and when I stopped by him and started rummaging in my pockets to get it out he just looked at me, still with my helmet and sunglasses on, and asked ‘are you Spanish?’ in a thick southern accent. ‘Yes’, I replied, and he said ‘OK, go on’. Top notch security here, I got on the ferry without having had my passports checked once. The boat was a fast seacat and after only an hour of very bumpy sailing across the Gibraltar strait we moored in Algeciras. We had already said goodbye and were ready to go, I was going to ride back with Esteve in one go. 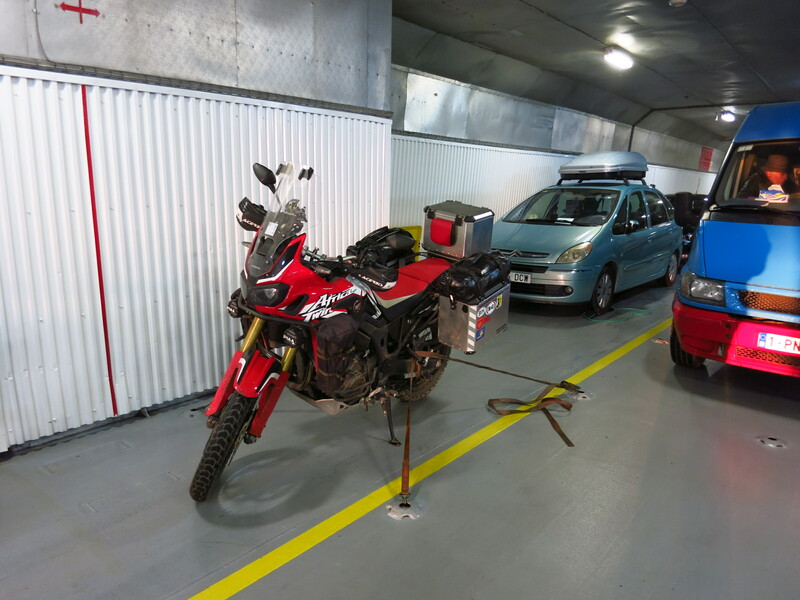 They lowered the ramp, we revved the engines and rolled out onto the pier, ready to hit the road and get kilometres under our belts as fast as possible, it was already 10am and we had at least 12 hours of riding ahead of us. 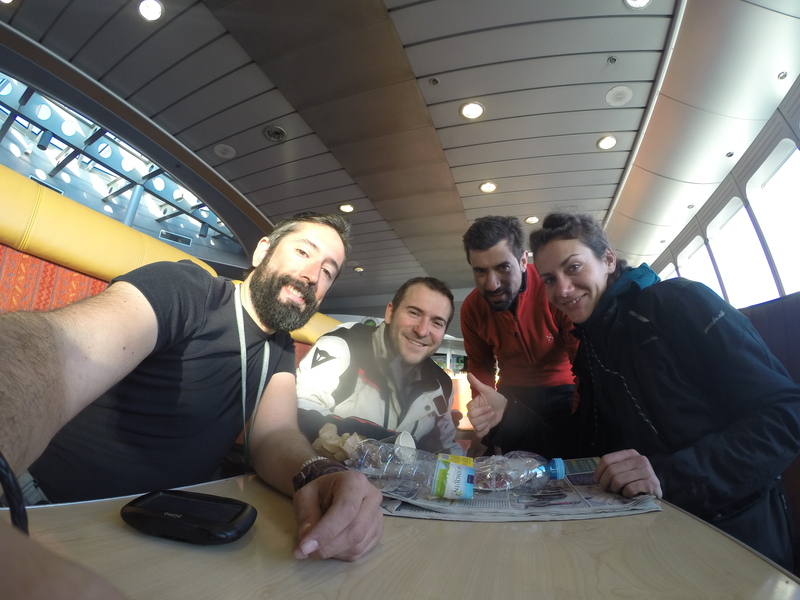 We turned towards the harbour exit and found… another customs checkpoint! Again! This time I had about five or six cars in front of me, and the police officer with the dog (yes, there was another dog) was making it sniff around each and every car on the line. Once he was done with the car in front of me, he looked at the bike and he waved me past. The dog was not bothered with my left pannier at all. Crossing borders with a motorbike is great. We were finally out of the harbour and the long way back home began. We used a combination of motorways with and without tolls, looking for the fastest and at the same time cheapest way to get back to Barcelona, and we decided we would only stop for fuel and once to eat, for lunch. There were clouds and maybe rain forecast in the south of Spain, but once we were away from the coast the sky cleared and we had perfect weather for riding, even though the temperature never went above 12ºC. On the second refuelling stop I had to put on all the clothes I had for the first time in the trip, we had been riding over 1,000km above sea level for hours and I was freezing. Things got a bit better when we got near the coast again past Murcia, but only for a short while. Night caught us still south of Valencia, and I finally made it to my front door at about 10:20pm, after leaving Esteve in Vilafranca. 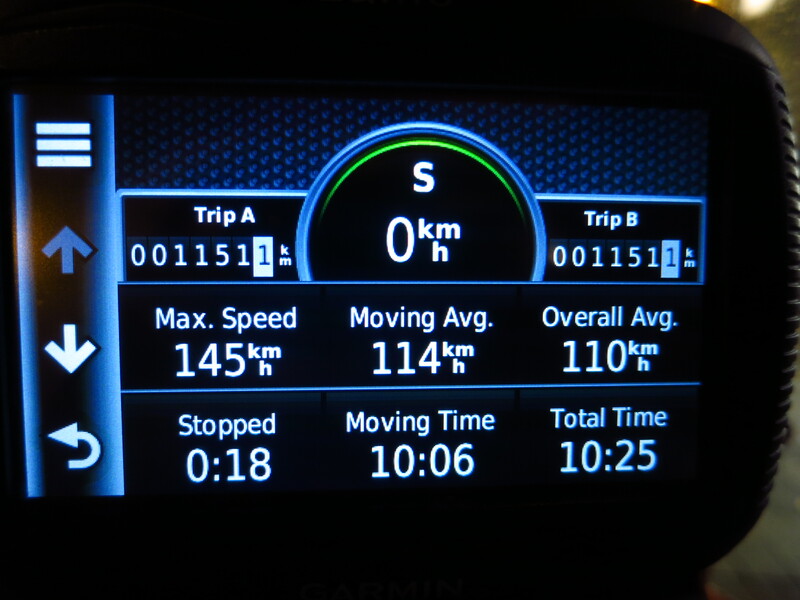 We managed 1151km in 10 hours and 26 minutes, according to the GPS, the fastest we had ridden in two weeks. As I looked up from the GPS, I saw Nat, who was coming back home with a pizza and some beer as a welcome present. Now, THAT is love. 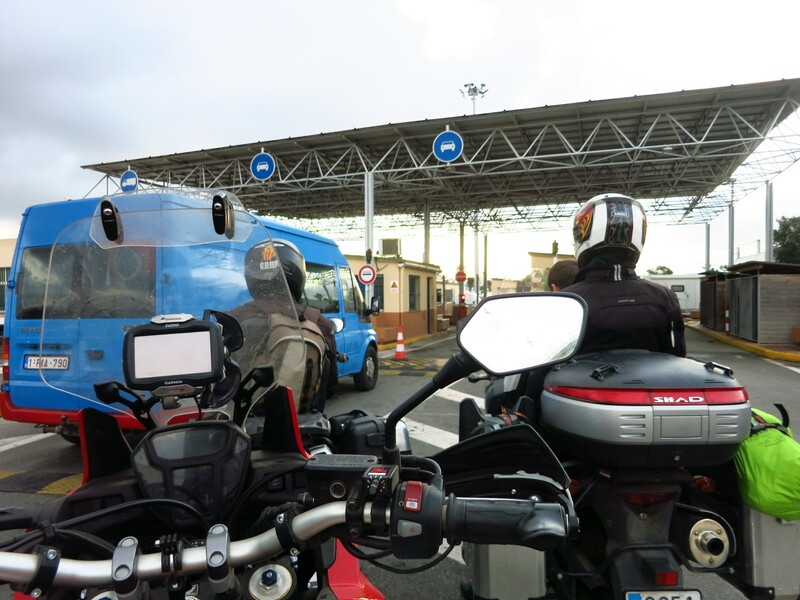 This entry was posted in Moroccan Christmas 2016, Travel and tagged Algeciras, Border crossing, Ceuta, ferry, Honda CRF 1000L, Morocco by Kilian. Bookmark the permalink.